On this page you'll find a selection of items belonging to the group of soups, sauces, and gravies. Through the links on this list of foods that are soups, sauces, and gravies and you will know their properties and amount of nutrients that each food has. 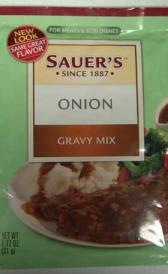 Below is a list of foods belonging to the category of soups, sauces, and gravies. Clicking on each one of them, you can view the properties of oils and nutritional information in addition to the benefits to your body. Dry cubed beef broth soup: High in ash, sodium and selenium and low in water, total dietary fiber and zinc. Mix dry beef noodle soup: Mix dry beef noodle soup is high ash, phosphorus and potassium. On the other hand. is low in water, vitamin c and pantothenic acid. Mix dry onion soup: This food is low in water, total lipid and vitamin c but Mix dry onion soup has ash, carbohydrate and potassium in high quantity. Powder dry cheese sauce: This food has a low quantiti of water, iron and copper but has a high quantity of food energy, protein and total lipid. Canned au jus gravy: In this food there are some nutrients that are found in low quantity, for example food energy, protein and total lipid. Dry au jus gravy: This food has a low quantiti of water, total dietary fiber and total sugars but has a high quantity of ash, iron and sodium. Dry brown gravy: This food is low in water, total sugars and vitamin c but Dry brown gravy has ash, carbohydrate and sodium in high quantity. Dry chicken gravy: High in ash, carbohydrate and sodium and low in water, total dietary fiber and total sugars. Canned mushroom gravy: In food has a low quantity of protein, carbohydrate and total dietary fiber. Powder dry mushroom gravy: This food is low in water, pantothenic acid and vitamin a but Powder dry mushroom gravy has ash, carbohydrate and calcium in high quantity. Mix dry onion gravy: This food has a low quantiti of water, total sugars and pantothenic acid but has a high quantity of ash, carbohydrate and calcium. 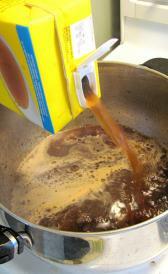 Powder dry pork gravy: High in ash, carbohydrate and total sugars and low in water, vitamin c and vitamin b12. Dry turkey gravy: This food is low in water, total dietary fiber and total sugars but Dry turkey gravy has ash, carbohydrate and sodium in high quantity. Barbecue sauce: This food is low in protein, total lipid and total dietary fiber but Barbecue sauce has total sugars and sodium in high quantity. Ready-to-serve plum sauce: In food has a low quantity of protein, total lipid and total dietary fiber. Thin white homemade sauce: In this food there are some nutrients that are found in low quantity, for example total dietary fiber, iron and copper. Salsa USDA Commodity: In food has a low quantity of food energy, protein and total lipid. Ready-to-serve fish sauce: This food has a low quantiti of food energy, total lipid and carbohydrate but has a high quantity of ash, magnesium and sodium. 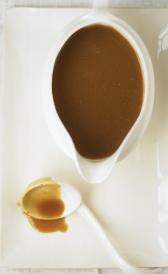 Dry brown instant gravy: Dry brown instant gravy is high ash, carbohydrate and iron. On the other hand. is low in water, vitamin c and vitamin b12. Dry instant beef gravy: This food is low in water, manganese and vitamin c but Dry instant beef gravy has ash, carbohydrate and total sugars in high quantity. Dry instant turkey gravy: This food has a low quantiti of water, vitamin c and vitamin b12 but has a high quantity of food energy, ash and carbohydrate. Dry alfredo mix sauce: High in food energy, total lipid and ash and low in water, manganese and vitamin c.
Fish broth: In this food there are some nutrients that are found in low quantity, for example food energy, protein and total lipid. Worcestershire sauce: This food has a low quantiti of protein, total lipid and total dietary fiber but has a high quantity of potassium and sodium. Low sodium barbecue sauce: This food has a low quantiti of protein, total lipid and total dietary fiber but has a high quantity of total sugars. Adobo fresco: This food has a low quantiti of protein, total sugars and zinc but has a high quantity of total lipid, ash and sodium. Ready-to-serve duck sauce: This food is low in protein, total lipid and total dietary fiber but Ready-to-serve duck sauce has carbohydrate and total sugars in high quantity. Tomato based steak sauce: High in ash, sodium and lycopene and low in protein, total lipid and calcium.